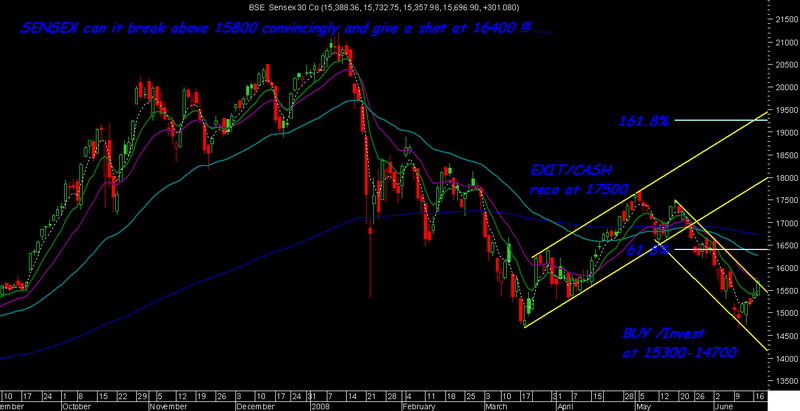 Can Sensex sustain 15800 and tgt 16400… !! Posting the chart again after some time with the reasons and view. Check the below link . As we see the current bounce back has reached the upper end of the channel and would ideally like this to be broken and take a shot at 16400 which is 61% retracment . Technically every upmove will continue to face resistance at higher levels so traders should be cautious if they take commitments at higher levels. 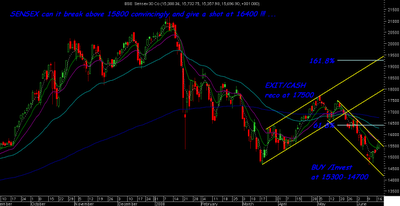 Investors those who did took our advise to buy at 14700-15300 should look to reduce /partial booking in rise above 15800 till 16400. DIVIS Labs, Reliance Capital have finally broken out and have space for further 5-10 % move. Buy IVR prime at 225-227 stop of 219 tgt 245-256 .
many stocks have bounced back strongly and would wait to see some in the day ... 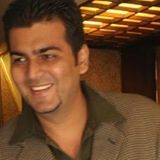 Many stocks were recommended to clients in dips to 14700 and would be looking to book them in coming days and trailing .